Granbury is home to the most historic courthouse square in Texas, and it attracts visitors for more than a few reasons. Experience boutique and specialty shopping in more than 40 one-of-a-kind stores housed in historic buildings around the Historic Granbury Square. You will also find a dozen restaurants and eateries while you’re experiencing the Square. Granbury prides itself on its preservation of the historic charm and authentic Texas experience of the Historic Granbury Square. Restore your curiosity in this one-of-a-kind historic Square! Download and print our Square Map today! The iconic Hood County Courthouse was the recipient of the Texas Downtown Association 2013 President’s Award for Best Restoration. The Historic Granbury Square has been recently restored to have larger sidewalks, more greenery and seating for visitors, all while preserving the historic aspect and ambiance. Additionally, the 1886 Granbury Opera House has recently been completely restored. This gorgeous theater sets the stage for the fantastic productions that the Granbury Theatre Company puts on year-round on this famous stage. Around Granbury, you can find over 40 Historic Texas Landmarks. Scoping out these spots is a fun-filled day in itself! Many Texas downtowns are the center of their communities, but very few serve as the lively hub of attractions, entertainment and history quite like the Historic Granbury Square. The Historic Granbury Square was the first courthouse square in Texas to be listed on the National Register of Historic Places. Being the first of its kind in Texas – you won’t want to miss spending evenings on the Historic Granbury Square, with a variety of different restaurants, bars, a thriving art scene, live-hit shows, historic museums and specialty shopping. Just minutes away are several beautiful and unique Bed & Breakfasts to complete your stay. 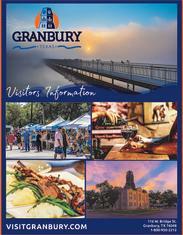 You can also find the City Park, or the City Beach Park and Lake Granbury just a short walk from the Historic Granbury Square.